TEJO (World Esperanto Youth Organisation) is an entirely youth-led youth organisation which works in the fields of culture, education, language policies, and promotes intercultural understanding and the participation of young people through educational programmes and activities. It is organised on a voluntary and collaborative basis. TEJO defends the richness of cultural and linguistic diversity, the rights of linguistic minorities, and provides spaces for intercultural dialogue. TEJO’s main activities are: youth events; publications and virtual platforms for active discussions on youth-related topics; trainings and providing tools to encourage mobility, participation, and international exchange of know-how. Our activities promote equality and multilingualism and are organised by youth, for youth. Furthermore, TEJO is an active member of the European Youth Forum, of UNITED for Intercultural Action, and of the International Coordination Meeting of Youth Organisations. Therefore, we need professional support for our work in these fields. If you would like to become the External Relations Officer of TEJO, the application deadline is 17 April 2019. The successful candidate will receive a gross monthly salary of € 1.615,80 for a full-time working schedule (40 hours per week). The contract will be initially for one year, with the possibility of extending it. The workplace is subject to agreement with the chosen candidate. Candidates who can easily travel to Brussels and sometimes to New York will be positively considered. The working schedule is flexible, on condition that deadlines are met and the employee is easily contactable when necessary. 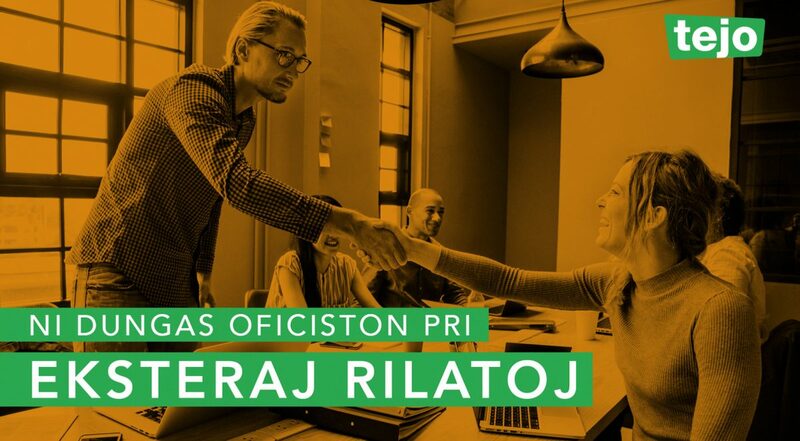 Send your application before 17 April 2019, including your CV, a motivation letter and a letter of recommendation to kandidatigxu@tejo.org and ker@tejo.org with “KER-oficisto 2019: Full_name” as an object.